Can you please introduce yourselves and tell us where and when you got married? We're Katrin and Maik. We met at Gala Nocturna, a gothic ball in Belgium during March 2015 and since this date we've been together, even though we're from different countries (Maik is from Germany, me - from Ukraine). Last Christmas Maik proposed to me and I couldn't say anything except "Yes!". Our wedding was in Germany, in Bad Bevensen, 5th August 2016. Your wedding outfits are amazing, how/why did you choose them? Thank you so much! For us it wasn't very difficult, because every year we have to choose our 4 (at least) outfits for visiting the Wave Gothic Treffen festival and some other events. Also Maik is a digital artist and I'm a designer of accessories at MyWitchery on Etsy, so we already have experience and quite a lot of ideas in our minds. Who made your outfits? Were you happy with them? Everything was made for us by our friends from Ukraine. As a designer, alternative model and just a lucky person, I have been fortunate to meet a lot of talented people during my life, and now I’ll introduce every one of them. My dress was made by Alice from Alice Corsets, because I'm in love with her perfect works and many years ago she offered to make a wedding dress for me. Since then she has made lots of incredibly wonderful dresses and corsets for me as well! Also I really appreciate the opportunity to directly take part in the creation of my clothes. 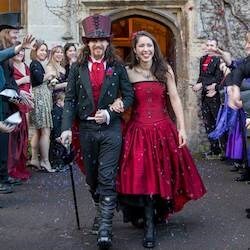 Katherine from Dress Art Mystery made Maik’s suit for our wedding, also previously she made some absolutely stunning outfits for us both! Katherine is a very creative and professional person. She can always see the best way to realise the ideas you have for your outfit - from choosing the right fabric, down to small details. Me and Maik love the art of H.R. Giger and wanted to have wedding rings in this biomechanical style. So I asked my friends Alexandra and Tamara, who are jewellers (take a look at Svart Skog on Facebook) about it and got even more - rings, a beautiful silver pendant as a gift and a borrowed bracelet and tiara. So wearing a borrowed item during the wedding was also checked then. 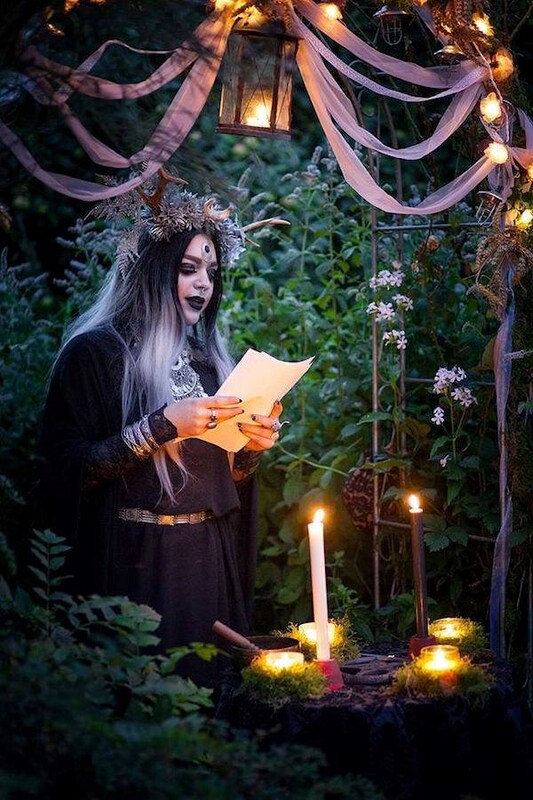 And I can not mention my dear friend Alexey Verbitskiy enough, who made an unforgettably beautiful Handfasting Ritual for us (and, as a professional hairdresser, helped with our hair). In general, all of our friends and relatives helped to make this great day incredibly marvelous! Sure, we were (and are) absolutely happy with everything! Was there any pressure to wear a more traditional white dress? Oh, at first I couldn't say what I really would like to wear - ivory, red or a completely black dress. My mom was a little bit in shock of my idea to wear black (although it wasn't something absolutely new for her - 99% of my casual clothes are black). When me and Alice started to look for lace, we found amazing black guipure with floral ornaments, but you couldn't see the ornaments on a black background. So we decided to combine 2 colours - black and delicate pink. I love this duo and my mother was happy with my decision as well. 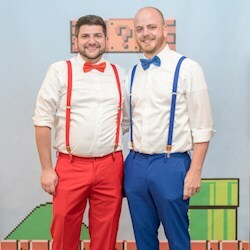 Were your outfits part of an overall wedding theme? 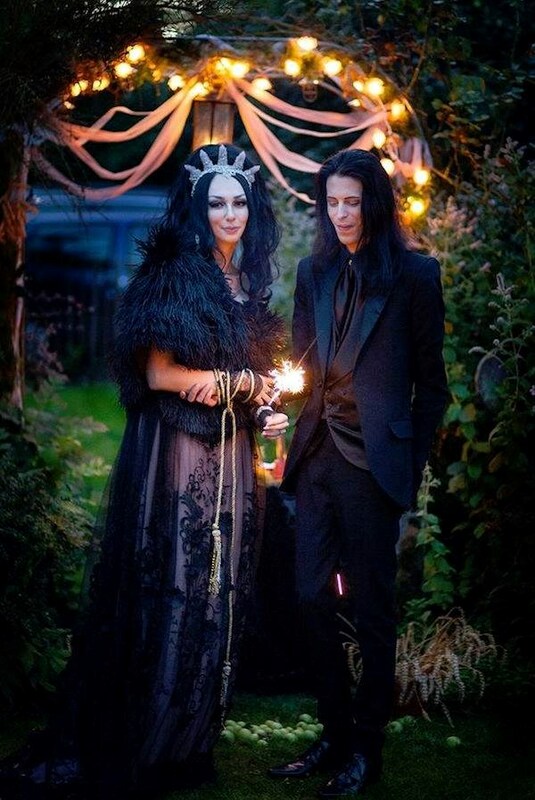 Both of us are into Gothic and Wicca, but we didn't have a strict wedding theme, just wanted to mix everything, that we like, in the most harmonious way. But in terms of colours, we mostly kept the decorations black, white and green/whatever nature has to offer. Maik made a lovely surprise for me and ordered a very special wedding bouquet! I adore fresh flowers and was so happy to receive a bouquet of fresh black roses! Our wedding was in our pretty big garden, so we didn't have problems with decorations - flowers, berries, beautiful plants were everywhere, we just had to add some lights and ribbons. Maik’s mom even cooked some dishes and made our wedding cake! The photos are excellent, what can you tell us about your wedding photographer? Galina is my friend from Ukraine and one of my favourite photographers. Her pictures are awesome! She was so kind to visit Germany just for our wedding, even though she has a lot of projects. She did such a great job! At the moment, we only have photos of the first part of our wedding, but with time we would be glad to show you a sequel. 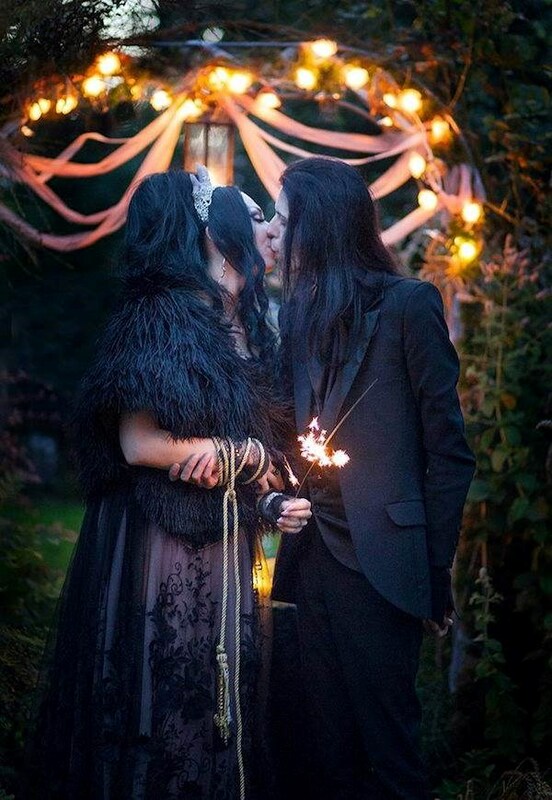 Thanks for sharing your truly beautiful Gothic wedding photos with us! See more images on Galina Aster's website and her Facebook page. A huge thank you to Galina for letting us use her photos!